I’ve fallen into an after school routine with P for the last few weeks. She comes home from school, eats, naps, watches tv, eats, goes to bed. It’s so lame I can’t stand it! However, I’m giving myself a break because I’m at the end of my pregnancy and I’m exhausted and in pain. Today I hit 38 weeks and I seem to have gotten a second wind. I’ve been having contractions almost daily. In fact, this morning I woke up to them, but I’ve gotten myself to think of the pain as a good thing, and it is. It’s better to feel the pain gradually and to open up slowly than to have it all happen at once. I’m also hoping the longer the pain now the shorter it will be at time of delivery. I can only hope. 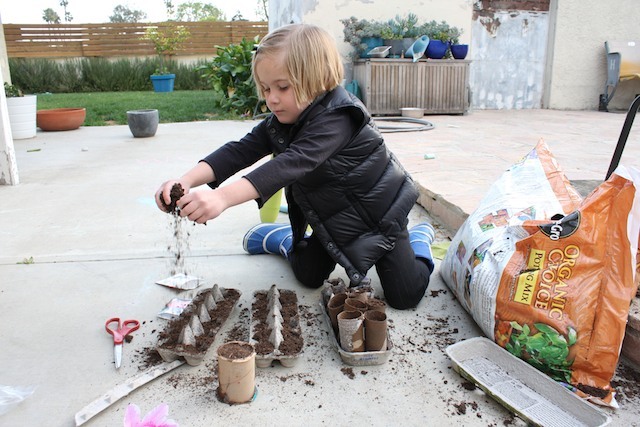 With my second wind I felt I should do more with P. She’s been talking about planting a garden for a while. Last week we bought seeds at Target. I was amazed she understood I didn’t want to buy their seeds because they weren’t organic. She said “let’s get flower seeds, we don’t eat them”. She’s getting so many concepts that aren’t spelled out for her. She’s having to connect the dots and I think she’s doing it quite well. 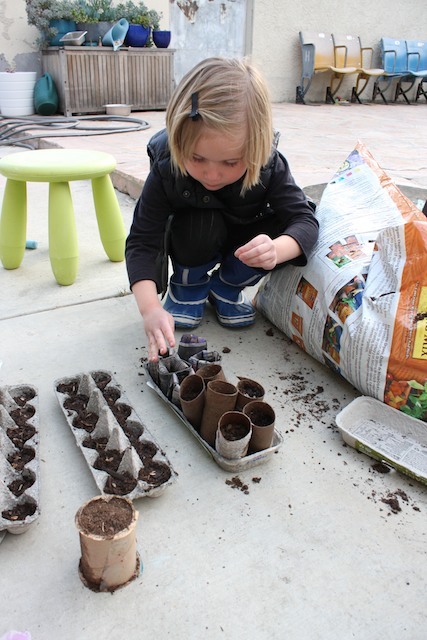 Then over the weekend I looked for DIY seedling cups to make. I made a few different varieties that I’ll discuss and source later. So today we finally planted our seeds. 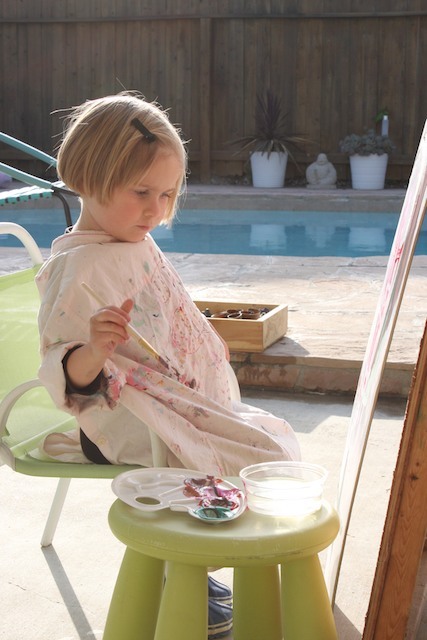 After that P wanted to paint so she painted outside. The weather was a bit chilly but it was sunny and beautiful and she wanted to be outside. 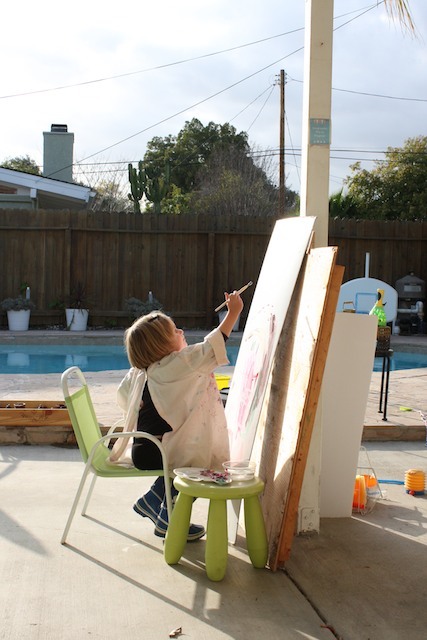 Her art classes at LACMA have changed the way she paints. She is using different brush stroke techniques and the way she looks at her work is different. Things are changing in that head of hers. Doing all of this eased my guilt of letting her plop down on the couch and watch tv for the rest of the afternoon. I can’t do it all right now. I’m praying after the baby is born and I give it a few weeks I’ll have my full energy again and be more available to P. I miss our outings. But on the other hand, my lack of energy and large body size is nature’s way of easing me into the juggle of two. 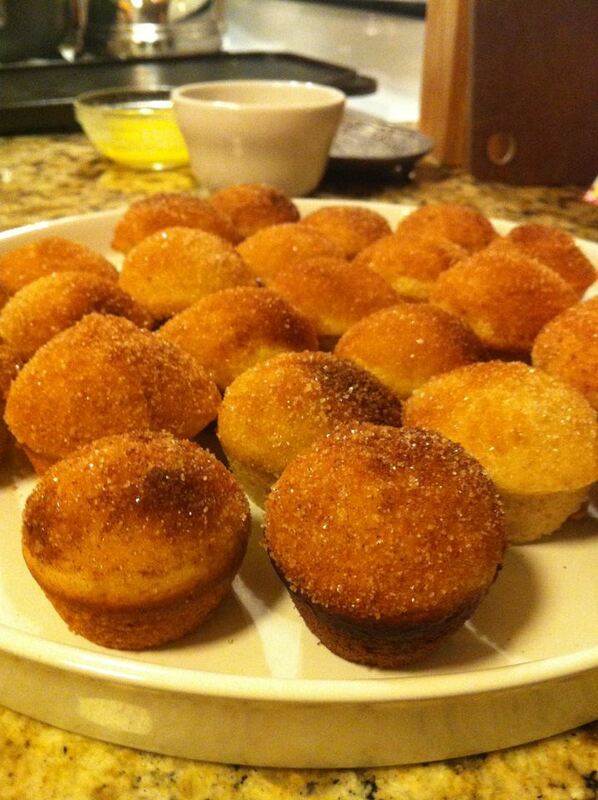 We did one last baking project before dinner. After, I should have known something was up when P wanted to go to bed instead of having dessert. Turns out she has a fever. The end to our brilliant day.